HansenGroup has concluded a Partnering agreement with Abu Dhabi Reem Emirates Aluminium Ltd (REA). 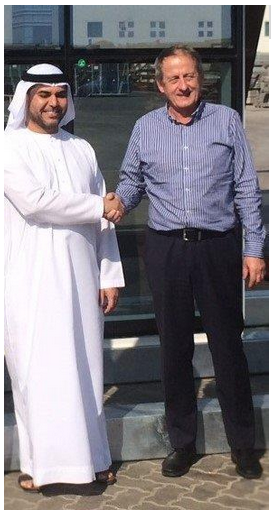 HansenGroup, the parent company of Manchester based aluminium/glass Contractor HansenFacades, have signed a Partnering agreement with Reem Emirates Aluminium LLC that gives Hansen the European access to their know-how and production capacity for unitized aluminium facades for high-rise building (skyscrapers). REA is among the Middle East's largest producers of tower facades and have executed several major projects e.g. the facades of the 900m high Etihad Towers in Abu Dhabi. REA is owned by Royal Group and the factory has a production capacity of 50,000m2 unitised curtain walling per month, making it one of the world's largest facilities. The collaboration was initiated in Spring 2014, when HansenGroup's UK based facade company HansenFacades used REA as a subcontractor for a prestigious project on Greenwich Peninsula, London - where HansenFacades is just completing the £7m projects. During a recent visit to Abu Dhabi, Hans Kolby Hansen (HansenGroup), Tomas Andersen (HansenGroup UK) and Colin Meads (HansenFacades) finalised the details of the agreement. 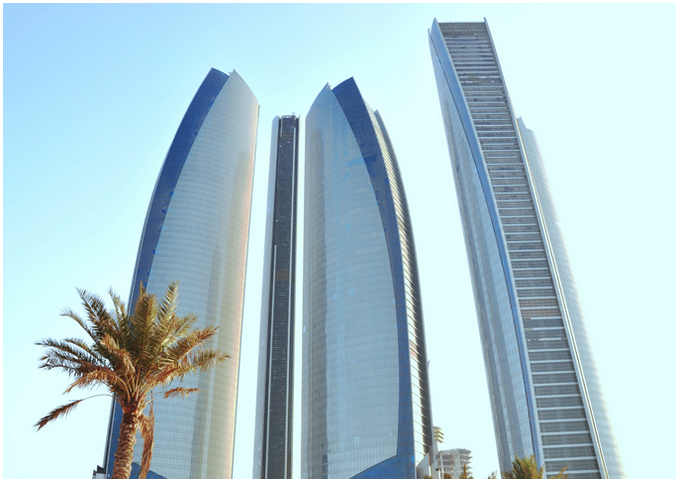 The Etihad Towers Development Colin Meads stated "Reem's Unitized facade products complement our current systems perfectly, enabling us to offer a full range of facade solutions to our customers. Hansen's own UnitAl prefabricated facade solutions work well for low rise more bespoke architectural facades frequently used by the Group in Scandinavia, whereas Reem's Unitized facades are better suited to meet the logistical requirements of high rise projects." HansenGroup is in a very good place at the moment, with a 2013/14 result EBIT of £1.1M and a large order bank of exciting projects. HSHansen in Denmark has just signed a £20 million contract for unique UnitAl facades to the Niels Bohr Institute in Copenhagen, and is currently concluding negotiation of a contract for a similar amount for yet another building in Copenhagen. Tomas Andersen, COO of HansenGroup UK is excited about this quantum leap for Hansen and is looking forward to winning work on similar size projects in the UK, "We are looking to take a leading role in major projects in the UK, with access to large capacity and competitive rates from the UAE coupled with our Scandinavian focus on quality and design it is a recipe for success." For more information, please visit www.reemalum.com and www.hansengroup.build.